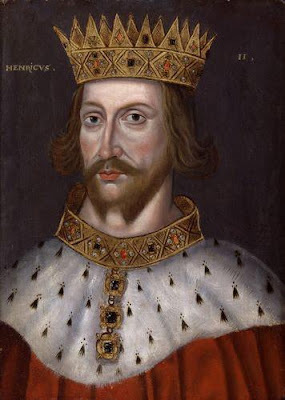 Henry II "Curtmantle", King of England was George Washington's 19th great-grandfather. He was the son of Geoffrey d'Anjou and the grandson of Henry I "Beauclerc", King of England. He married Eleanore of Aquitaine, one of the most important women in world history, who was descended from Charlemagne and who had previously been married to Louis VII Capet, King of France. As heir to the kingdom of Aquitaine, Eleanore was one of the richest women in Europe. Together Henry II and Eleanore of Aquitaine were to have the following children: Richard "the Lion-Hearted", King of England; John "Lackland", King of England" (and an ancestor of George Washington and Zachary Taylor); and Eleanor Plantagenet, George Washington's 18th great-grandmother who married Alfonso VIII, King of Castile (i.e. Spain). Barack Obama with his wife Michelle and children.